This renovated village rental offers a beautiful chef's kitchen and open layout. There is a large dining area with six person table as well as a comfortable living room with a gas burning wood stove. Wonderfully furnished this two bedroom home features an additional home office/den. Both bedrooms are spacious, with the master bedroom having a queen size bed and a renovated en suite bath. The second bedroom has a single trundle bed with the option to be able to sleep two. There is plenty of closet space in all of the bedrooms. The second floor has a renovated full bath and washer and dryer. The home office/den features a pull out sofa for additional sleeping. There is also a nice sun deck off the kitchen. 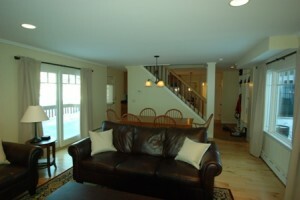 This rental comes complete with cable TV, flat screen TV and wireless internet for rentals under six months. The prime village location allows for you to walk to the center of the village, enjoy the shops, restaurants, bike path, easy access to the shuttle and all Stowe has to offer.